You can also set the ShutdownMode property to OnExplicitShutdown. This indicates that the application will not terminate even after the user closes all of its windows. Instead, you need to explicitly exit the application from within your code. Below, we set ShutdownMode to OnExplicitShutdown. 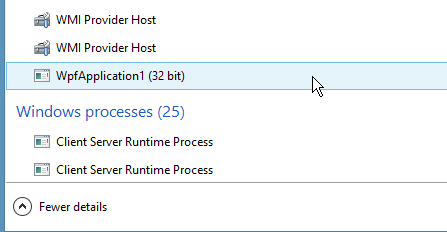 If you run this application and then close its main window, you’ll see the application disappear from the “Apps” section of Task Manager, but still show up under “Background processes”. Below is sample code that explicitly shuts down the application 10 seconds after the main window closes.